The company was formed by the coming together of Sam Courtney and Jimmy Nelson in 1960 having each run their own successful businesses as far back as 1918. As the business developed it relocated from Corporation Street, Springfield Avenue, Ravenhill Road and to Sunnyside Street where the distribution of confectionery, drinks and crisps became the focus from 1972 to 1987. The wages book of July 1972 shows the total employed of eight with Billy Thompson and Jimmy Dodds being the two salesmen with all their orders being delivered in a relatively small van. The business was managed by Arthur McWilliams until his death, at the age of 57, in 1977 at which time his son David took over responsibility of Managing Director. 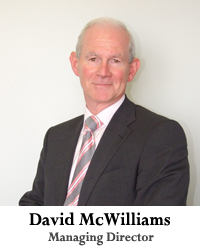 David has been involved in the business since leaving school in 1966 and remains in charge today. The company enjoyed particularly strong growth in the 70’s and 80’s which necessitated a move in 1987 to much larger premises at Boucher Cresent. The company now employs 40 staff and with a sales force of 8 covering most areas of Northern Ireland. Brand names, logos and trademarks are the property of their respective holders and are for descriptive purposes only.